The governments of Alberta and Canada and the Town of Banff are improving lives for families and individuals in Banff and the surrounding communities with the grand opening of the new Ti’nu affordable apartment complex. 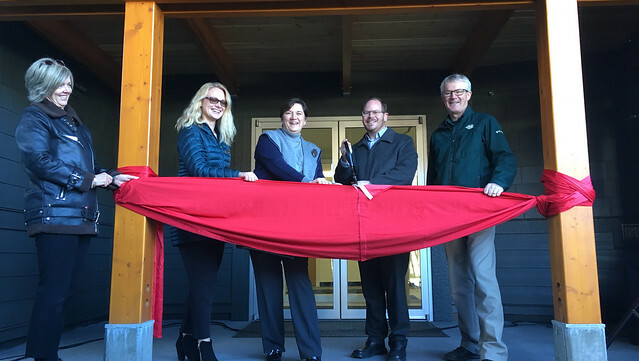 L to R- Sharon Oakley, Town of Banff, Elena Salikhov, CMHC, Banff mayor Karen Sorensen, MLA Cam Westhead and Greg Danchuk of Parks Canada cut the ribbon on the new Ti’nu affordable housing project in Banff. One hundred and thirty-one new units, including eight barrier-free units, will provide modern, affordable and much-needed housing in a community with a zero per cent vacancy rate. The Honourable Jean-Yves Duclos, Minister of Families, Children and Social Development and Minister Responsible for Canada Mortgage and Housing Corporation (CMHC), along with Cam Westhead, MLA for Banff-Cochrane, on behalf Lori Sigurdson, Minister of Seniors and Housing, and Greg Danchuk, Visitor Experience Manager of Banff National Park for Parks Canada, on behalf of the Honourable Catherine McKenna, Minister of Environment and Climate Change and Minister responsible for Parks Canada, joined the Town of Banff at the celebration today. The Government of Alberta, with support from CMHC, provided an $11.9-million investment for this project, under the Investment in Affordable Housing 2014-2019 Agreement. The Town of Banff also contributed $11.9 million toward this project. Parks Canada provided the land to the Town of Banff at a considerable discount. Banff has had a zero per cent vacancy rate for more than three years. The 2013 Banff Housing Needs Study reported that 61 per cent of households were paying 30 per cent or more of their gross income on housing, while 28 per cent were paying 40 per cent or more. The Banff Housing Corporation, a non-profit organization wholly owned subsidiary of the Town of Banff, will manage the Ti’nu affordable apartment complex. The Government of Canada is currently rolling out its National Housing Strategy (NHS) – a 10-year, $40-billion plan that will create 100,000 new housing units and lift 530,000 families out of housing need, as well as repair and renew more than 300,000 housing units and reduce chronic homelessness by 50 per cent. The Alberta Ministry of Seniors and Housing fosters the development of affordable housing and supports access to housing options for Albertans most in need. The Alberta government is investing $1.2 billion for affordable housing capital needs. To achieve these outcomes, the ministry works with seniors, Albertans who require housing supports, their families and caregivers, communities and other government partners. A more detailed description of the ministry and its programs and initiatives is found at www.seniors-housing.gov.ab.ca. As Canada's authority on housing, CMHC contributes to the stability of the housing market and financial system, provides support for Canadians in housing need, and offers unbiased housing research and advice to all levels of Canadian government, consumers and the housing industry. For more information, please visit cmhc.ca or follow them on Twitter, YouTube, LinkedIn and Facebook. Editor's Note: This news release was also issued by the Canadian Mortgage and Housing Corporation on Oct. 17, 2018.